In common with AGCO Corporation, the next six months are likely to see significant challenges for the agricultural machinery company. Here's why investors should be cautious on the stock. While the slump in other commodities continues to attract most of the headline attention, the agricultural sector remains in a slump. Key crop prices such as corn, wheat, and soybeans remain in a downward trend, and agricultural machinery companies such as Deere & Company (NYSE:DE) and AGCO Corporation (NYSE:AGCO) continue to suffer sales declines. Let's look more closely at one of those names: Deere. The big fear with Deere in 2016 works a bit like this: If crop prices continue to weaken, then the resulting pressure on farmers' incomes will lead to further declines in agricultural machinery sales. Of course, this is nothing new -- it's just how the cycle works in the agricultural sector. However, what's new is the way Deere has built up the amount of equipment it has on operating leases -- this is where a farmer prefers to lease equipment rather than make an outright purchase. The following chart shows leases have grown as sales have fallen. DATA SOURCE: DEERE & COMPANY PRESENTATIONS. CHART BY AUTHOR. When the operating leases expire, there could be a glut of used equipment on the market. The increase in operating leases is masking weakness in farmers' financial positions. Of course, these issues can dissipate with an increase in crop prices, but as the first chart showed, that hasn't happened in 2016. Moreover, on the recent third-quarter earnings call, Deere Director of Investor Relations Tony Huegel said egarding leases, "We'll hit some pretty strong maturities in the fourth quarter of this year, and then certainly as we move into spring, you know, next year is, I think, another kind of wave of maturity." In other words, the next six months could see significant pressure coming from maturing leases. Moreover, it comes at a time when the industry is challenged to reduce inventory. As Deere's manager of investor communications, Joshua Jepsen, said on the last earnings call, "I think things are stabilizing, but I want to be clear we have a lot of work on the actual level of used inventory at our dealers that will continue into 2017." To be fair, Deere and AGCO have both taken strides to reduce inventory, but it's more a case of running hard to stand still. For example, Jepsen claimed that Deere would end the fiscal year with the field inventory-to-sales ratio for large agricultural equipment (the most challenged area) similar to 2015. In a similar vein, AGCO CFO Andrew Beck claimed that AGCO's North American dealer inventory was lower overall by 15% in the first-nine months -- and lower by 20% for large machinery -- but this is hardly good news, because AGCO expects a 10%-15% decline in machinery sales in North America in 2016. Meanwhile, Deere forecasts a 15%-20% decline. In other words, if sales keep declining, or a glut of used equipment appears on the market, then the industry will still face significant pressure to reduce inventory. 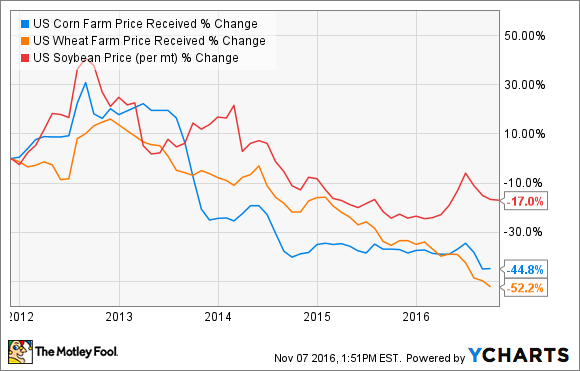 Along with the buildup in Deere's equipment on operating leases, another difference between previous cycles is the benefit Deere's customers are getting from low interest rates. Indeed, Deere's forecast for credit loss provisions for 2016 stands at just 0.23%, far lower than the 10-year average of 0.24% and 15-year average of 0.39%. The question is, what rate will that be if the Federal Reserve starts raising rates? It's particularly important, because Deere's forecasting 36% of its net income to come from financial services. All told, while Deere may well be a great long-term investment, I don't think it's a great time to buy buying Deere or AGCO stock. The combination of maturing leases and possible interest rate rises, at a time of inventory challenges, falling sales, and ongoing low crop prices, means risk is rising. Granted, higher crop prices would help, but until that occurs, cautious investors might want to stay clear.